Spectro Jel, which is actually a light lotion, is good for treating back acne. Spectro is a division of Glaxo Smith Kline that makes benzoyl peroxide lotions and pads for acne treatment in Canada. 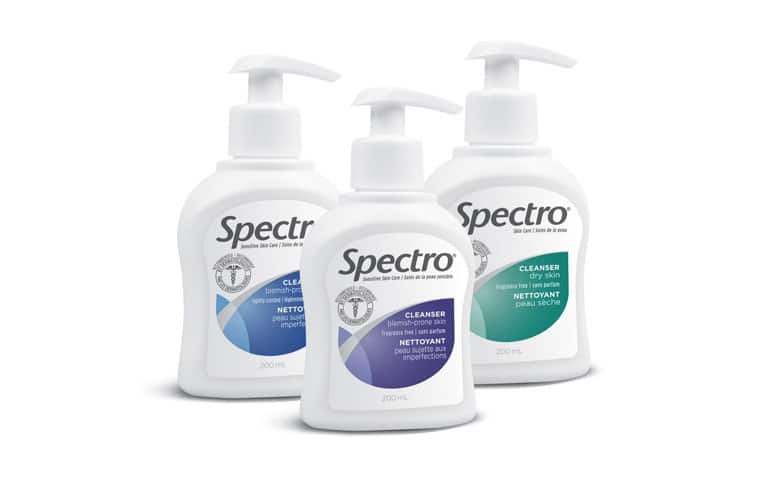 Spectro actually does not make a “gel.” Its products are a light lotion for use once or twice a day on a regular basis. The 2.5% concentration of benzoyl peroxide1 in Spectro Vanishing Lotion for Sensitive Skin is a good place to start treating acne. Use the 5% benzoyl peroxide Deep Pore Vanishing Lotion when you know you do not have any adverse reactions to benzoyl peroxide. If you know you have sensitive skin (you have allergies or eczema, or certain chemicals make you break out), use Spectro’s Cleansing Pads for Sensitive Skin. Spectro is an especially good treatment for back acne2. Use sunscreen if you use the product and you might be exposed to strong summer sun. For a more complete acne care solution, consider Exposed Skin Care. Spectro makes three different products for acne care. Its Vanishing Lotion for Sensitive Skin is a 2.5% concentration of benzoyl peroxide in a light lotion that sticks to the skin without feeling greasy. Its Deep Pore Vanishing Lotion is a 5% solution of benzoyl peroxide intended for normal or oily skin in people who are not sensitive to benzoyl peroxide3. Spectro Cleansing Pads for Sensitive Skin let the user determine how much benzoyl peroxide to put on the face and for how long, giving complete control over redness and irritation. Spectro also makes cleansers and moisturizers for blemish-prone, dry, and combination skin. These Glaxo Smith Kline products are sold in Canada only. The advantage of Spectro products is that you can choose the strength of benzoyl peroxide4 you put on your skin. Doctors usually prescribe 5% or 10% benzoyl peroxide products. Many users find them to be simply too strong. Benzoyl peroxide at these concentrations often causes redness, irritation, itching, and sensitivity to the sun, and the hydrogen peroxide released by the product can bleach both clothes and hair. For people who have sensitive skin, Spectro offers a 2.5% lotion. Light on the skin, this concentration of benzoyl peroxide5 is usually tolerable. And because it does not cause side effects, people stick to their treatment programs so acne does not come back. For people who know they can tolerate benzoyl peroxide, Spectro offers a stronger lotion that gets rid of acne bacteria fast. And for people who aren’t sure, Spectro offers benzoyl peroxide pads you can use as gently as you like. Benzoyl peroxide is not for everyone. If you happen to live in a part of the world that gets lots of harsh, direct summer sun, benzoyl peroxide can make your skin especially sun-sensitive. If you have golden, Asian skin tones, it can even cause pigmentation in the form of persistent brown spots after acne heals. Harsh summer sun6, however, is not a big problem in Canada. Many Canadians can use benzoyl peroxide without side effects, and without irritation. The main consideration for the use of Spectro in Canada is making sure skin does not get overly dry in winter. When Should Spectro Be Your Treatment of Choice? The kind of acne that Spectro can treat better than other products is “bacne,” or back acne. Benzoyl peroxide works best on tough skin. The skin on the back is especially tough. Benzoyl peroxide won’t loosen up blackheads on your back, but it is usually the best non-antibiotic treatment for pimples7 on the back. Use Spectro after your dry off from your bath or shower, but be sure there is a protective barrier between the area of skin your treat on your back and clothes that could be bleached by the product. Many Canadian doctors prescribe a relatively gentle antibiotic called clindamycin for teens who have acne. If you are using a topical antibiotic gel, alternating with Spectro can kill the bacteria that the antibiotic misses and leave the skin less vulnerable to attack by antibiotic-resistant acne bacteria. It is important not to use any Spectro acne product more than once a day until you see how it affects your skin. If you don’t have unexpected redness or dryness of the skin, then use the product up to twice a day—less when you are out in the cold or in the sun for an hour or more a day. Can Spectro “Gel” Cause Anaphylactic Reactions? Then the next morning, the testimonial tells us, this user of Spectro gel was late for work. She washed her face, used a dab of Spectro, and noticed some irritation. She thought it was just cold weather dryness, since she lives in Canada. But a few minutes she saw that her whole face was purple. She started coughing. She felt her airways closing up. Her pulse started racing. Had the ambulance not arrived in 5 minutes, she was told, she surely would have died. Now she has to carry an Epi-Pen the rest of her life in case she ever has another equally horrible allergic reaction8. There are a couple of odd things about this report. One is that the first application of the product caused no problems and the second application of the gel allegedly caused an anaphylactic reaction. The other oddity about this report is that HealthCanada keeps track of incidents of this nature and there are no reports of anaphylactic reactions to benzoyl peroxide in Canadian records. And it’s just a little odd that the Internet story refers to a gel when the product is labeled as a “lotion” in Canada. Could an equally horrible reaction happen to you? Well, yes. It’s very remotely possible. Many people have serious allergic reactions9. Literally hundreds of thousands of substances trigger allergies. But nothing of this severity has happened to anyone else who has used Spectro gel. No such problems, however, have been reported by users of products made by Exposed Skin Care. Mills O.H. Jr., Kligman A.M., Pochi P., Comite H. Comparing 2.5%, 5%, and 10% benzoyl peroxide on inflammatory acne vulgaris. International Journal of Dermatology. 1986;25(10):664-7. Hassan J., Grogan S., Clark-Carter D., Richards H., Yates V.M. The individual health burden of acne: appearance-related distress in male and female adolescents and adults with back, chest and facial acne. Journal of Health Psychology. 2009;14(8):1105-18. Fakhouri T., Yentzer B.A., Feldman S.R. Advancement in benzoyl peroxide-based acne treatment: methods to increase both efficacy and tolerability. Journal of Drugs in Dermatology. 2009;8(7):657-61. Sagransky M., Yentzer B.A., Feldman S.R. Benzoyl peroxide: a review of its current use in the treatment of acne vulgaris. Expert Opinion on Pharmacotherapy. 2009;10(15):2555-62. Feldman S.R., Chen D.M. How patients experience and manage dryness and irritation from acne treatment. Journal of Drugs in Dermatology. 2011;10(6):605-8. Dréno B., Bettoli V., Araviiskaia E., Sanchez Viera M., Bouloc A. The influence of exposome on acne. Journal of the European Academy of Dermatology and Venereology. 2018;32(5):812–819. Dréno B. Topical antibacterial therapy for acne vulgaris. Drugs. 2004;64(21):2389-97. Minciullo P.L., Patafi M., Giannetto L., Ferlazzo B., Trombetta D., Saija A., Gangemi S. Allergic contact angioedema to benzoyl peroxide. Journal of Clinical Pharmacy and Therapeutics. 2006;31(4):385-7. Topical Acne Products Can Cause Dangerous Side Effects. U.S. Food and Drug Administration. 2014.